I first became aware of the Scottish poetry journal Anon through some of the poets I follow on Twitter (most of whom I’ve included in my poetry list, which you can follow too here. 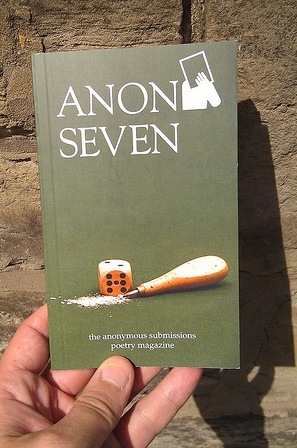 Anon is edited by poet and social media producer Colin Fraser and Peggy Hughes, who works at the wonderful Scottish Poetry Library. One cool thing about Anon is its format, which is reminicent of those old Penguin Classic paperbacks. The other is its completely anonymous submissions process. I submitted a few poems to the magazine last year, including one poem I’d written in Alaska over a dozen years before called “Midnight Sun.” The poem got picked and appeared in Anon 7.
names ill-suited for their frail appearance. outside the room at Gram’s B&B. swirling into TV screen volcanoes. may require a second look. four and one-half hours from now.